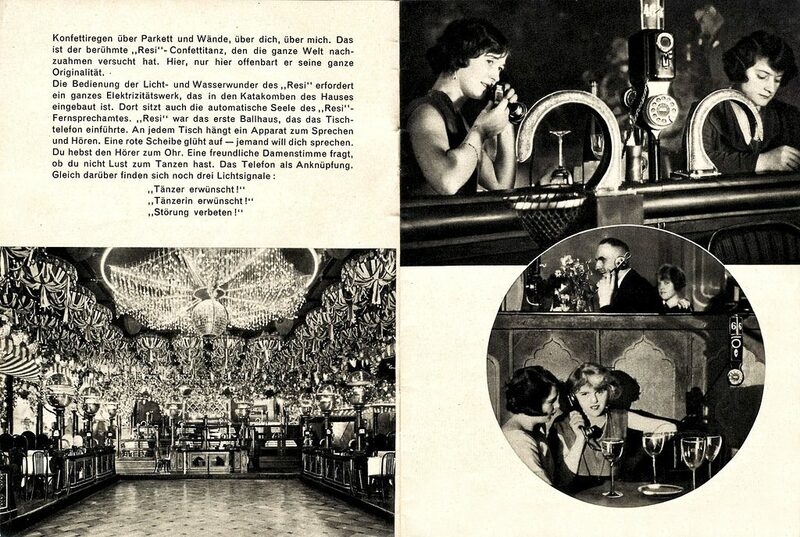 ‘Jeder Einmal in Berlin!’ by Hugo Hirsch & Alfred Müller-Förster, published by Hugo Hirsch (Charlottenburg, 1927), photo collage by Albert Vennemann. This photo collage by Albert Vennemann conveys the buzz of a dynamic, modern city. 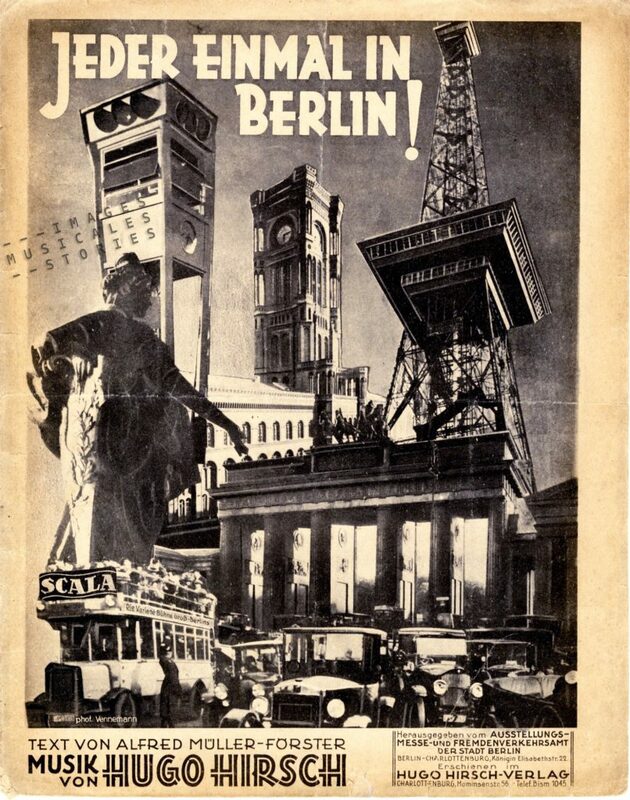 We recognise the famous light traffic tower from Potzdammer Platz, the Brandenburg Gate, the Rotes Rathaus, the radio tower, the ubiquitous cars and a bus with an advertisement for the Scala, a very successful variety hall internationally reputed during the Golden Twenties. 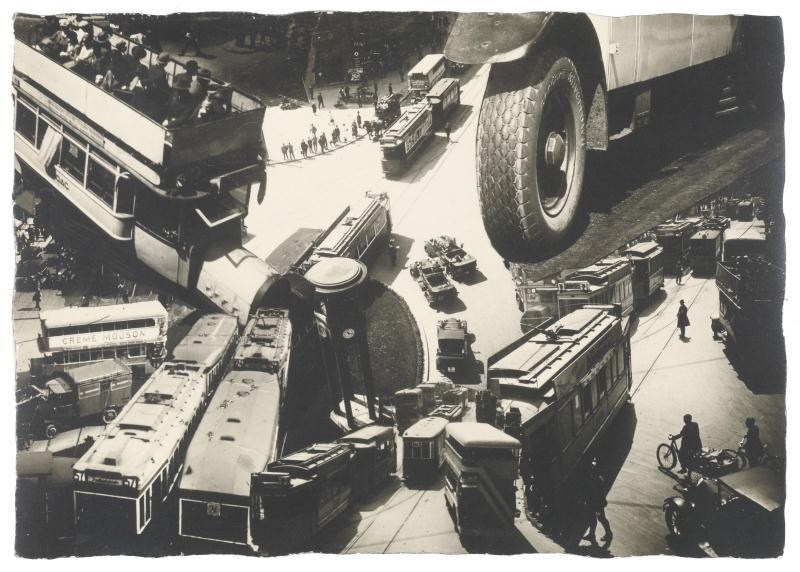 Beautiful Berlin, photomontage of traffic in Berlin by Albert Vennemann. Source: MutualArt. 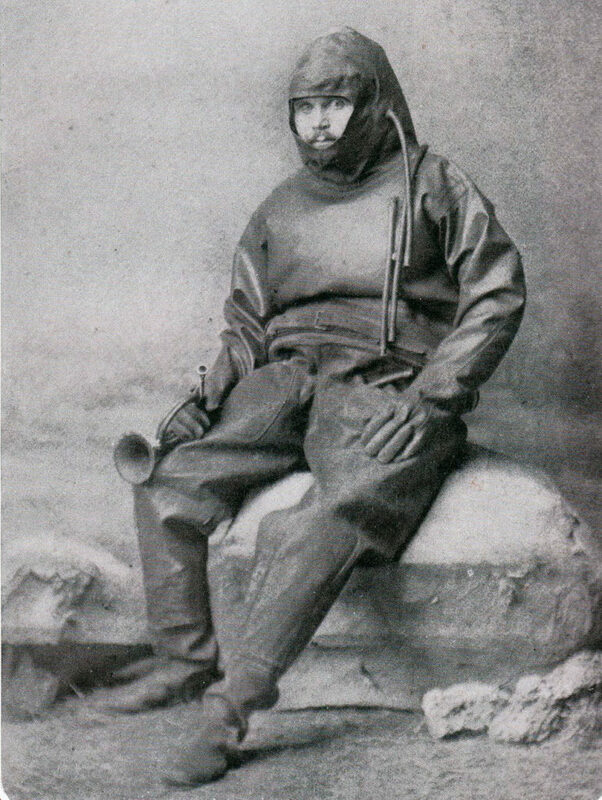 Vennemann was a Berlin photographer, who is now almost forgotten. 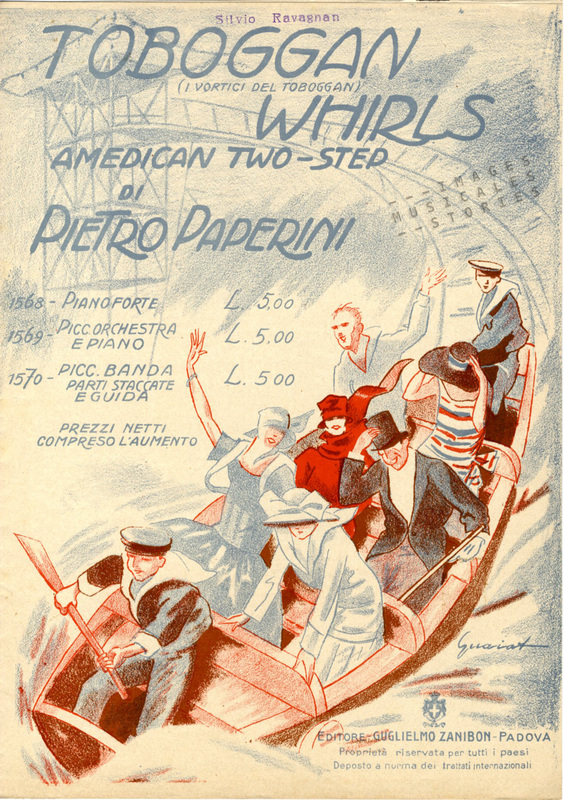 He made pictures of everyday street life, capturing the idyll of the city and the (new) charms of illuminated advertising. He became an expert at photomontages of contemporary architecture and technology. Thus, Vennemann provided the visuals for the first Berlin city marketing campaign Jeder einmal in Berlin, meaning everybody should be at least once in Berlin. It is also thanks to another artist, Walter Ruthmann, that we can witness the industrial, technical and cultural modernity that emanated from Berlin at that time He created his avant-garde film Berlin: Die Sinfonie der Großstadt (Berlin: Symphony of a Great City) in 1927. It is an invaluable time capsule of a Berlin that —fifteen years and 350 air raids later— would be dramatically destroyed. 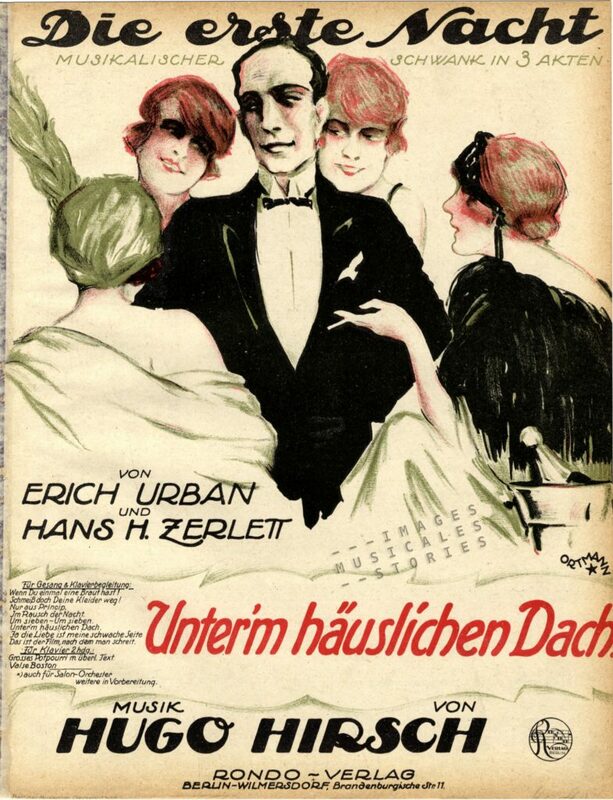 ‘Die erste Nacht’ by Hugo Hirsch & Hans H. Zerlett, published by Rondo Verlag (Berlin, 1922) and illustrated by Ortmann. The popular march for the Jeder einmal in Berlin campaign was composed by Hugo Hirsch, a composer of well-received operettas. He left Germany in 1933 to escape Nazi anti-Semitism, and was able to survive the war by staying in France. 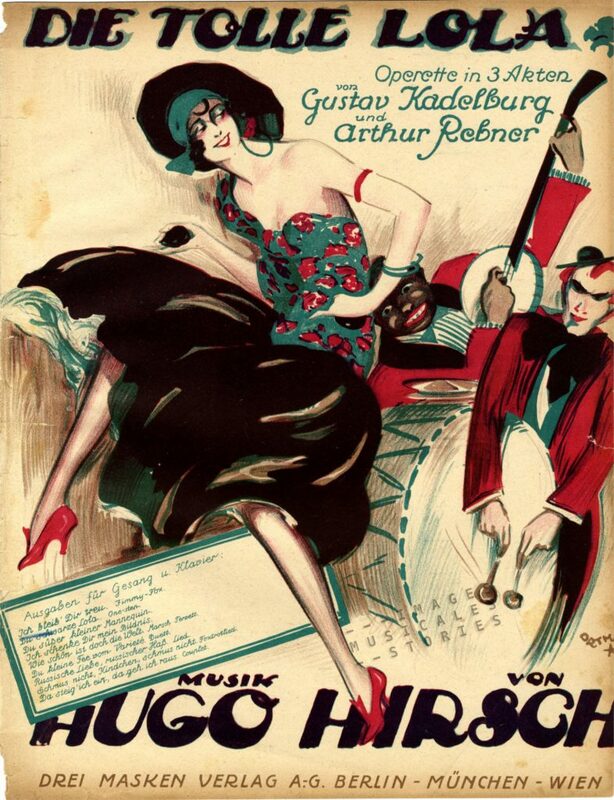 ‘Die tolle Lola’ by Hugo Hirsch, Gustav Kadelburg & Arthur Rebner, published by Drei Masken Verlag (Berlin, 1922) and illustrated by Wolfgang Ortmann. 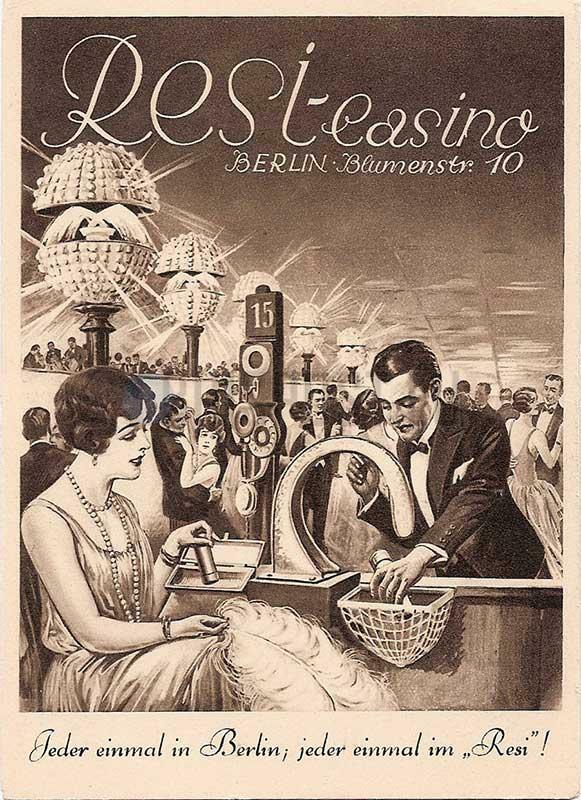 The promotional slogan Jeder einmal in Berlin was picked up by the Residenz-Casino, nicknamed the Resi: Jeder einmal im “Resi“! The Resi was a vast dance-hall where everything seemed bigger and more luxurious than in any other dance venue. Each table had a connection to a pneumatic table-mail-service post. Using the pneumatic post, a patron could send intimate messages to revellers at other tables along with small presents: cigarettes, cigars, chocolates, pens, perfume, matches or tiny manicure pouches. There was a long list of gift items to choose from. Moreover, each table had its own telephone with a clearly visible table number on top. 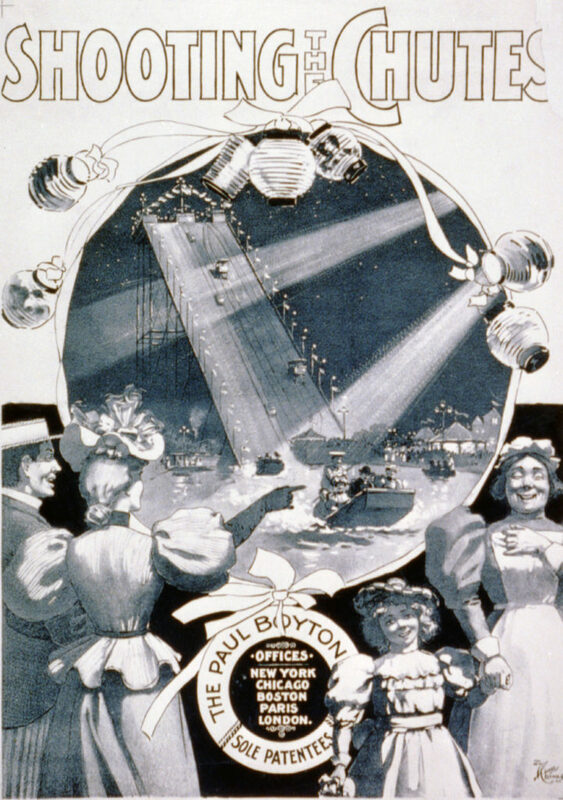 Above it was a lightbulb that could give one of three signals: dancer wanted, female dancer wanted or do not disturb. 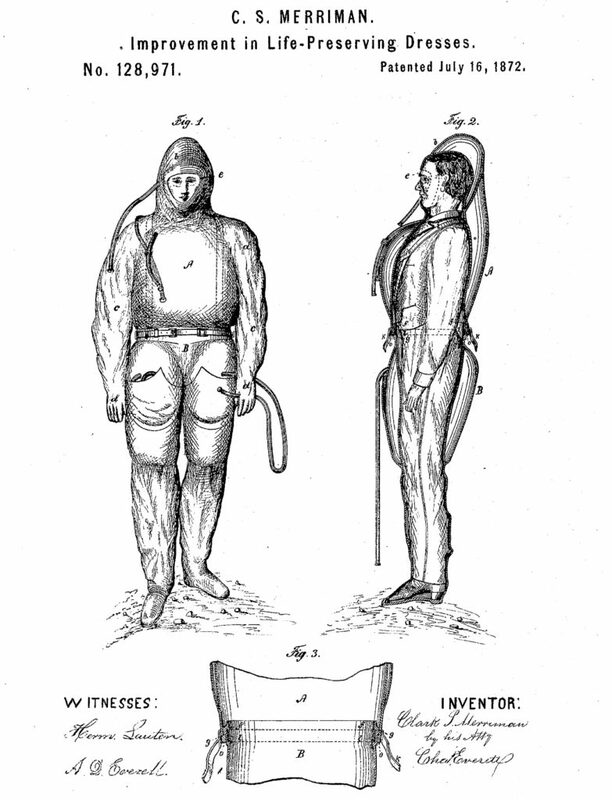 This technology must have given plenty of opportunities for romantic thrills and flirts with complete strangers. 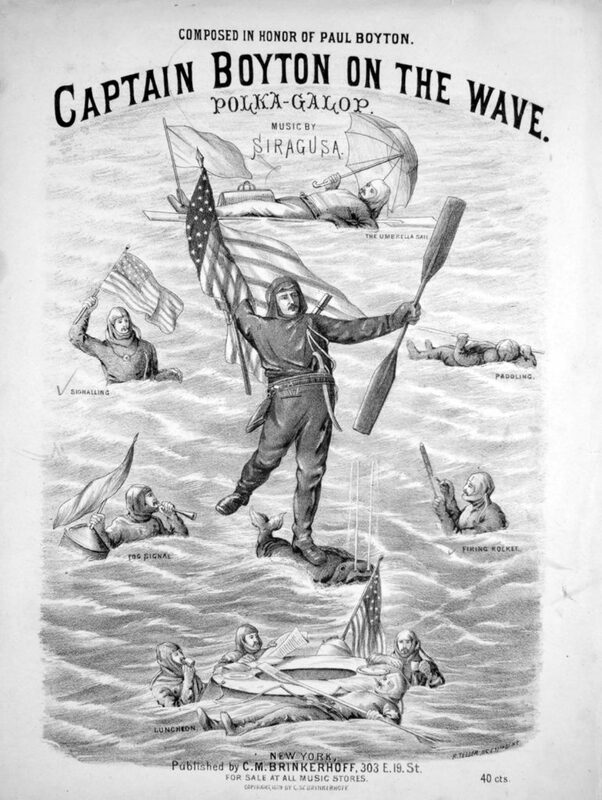 Everybody —at least once!— at the “Resi“. 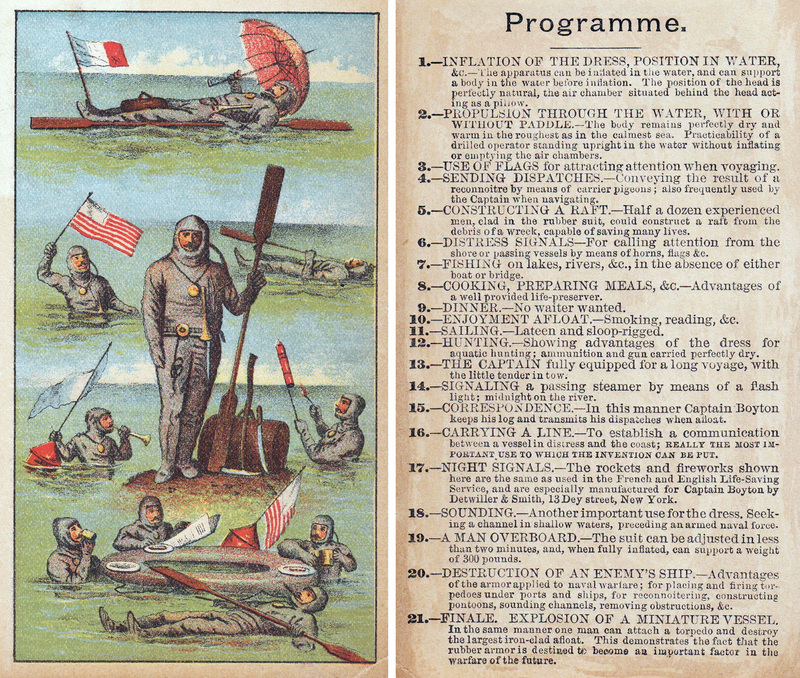 Promotion booklet for the Resi. ‘La Polka du Cochon‘ by Georges Hauser & René de St. Prest, published by Emile Gallet (Paris, sd) and illustrated by Faria. 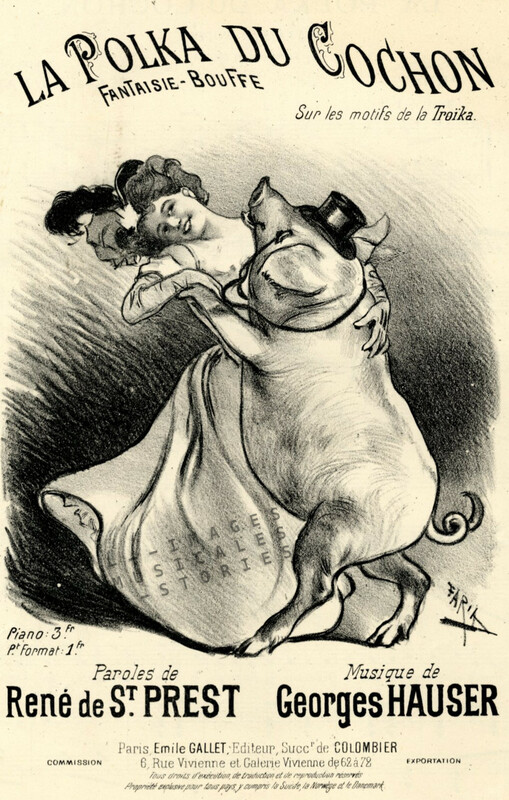 The Dancing Pig was a French vaudeville act at the beginning of the 20th century. 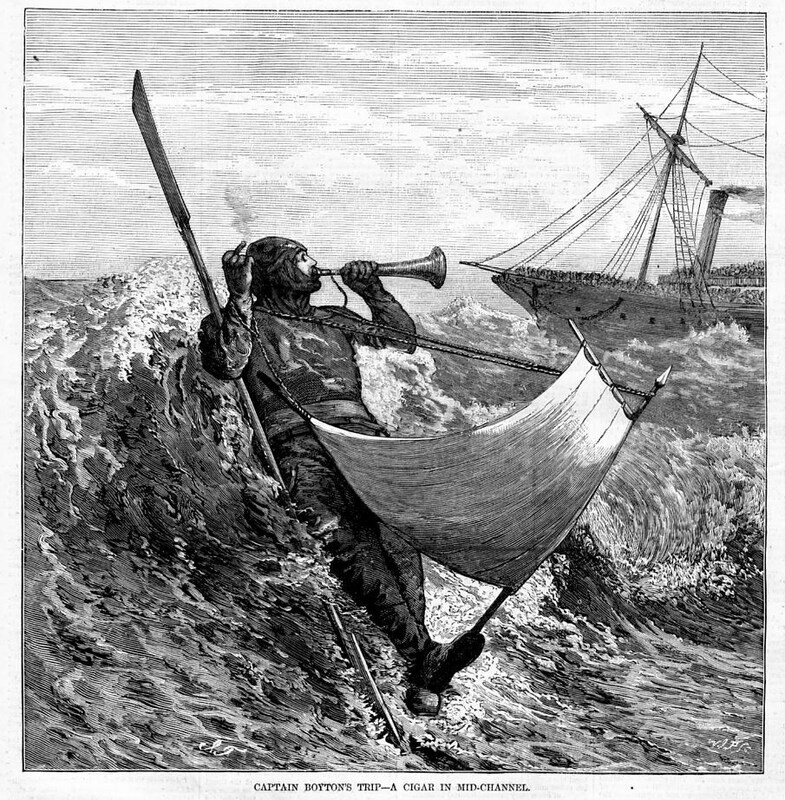 In 1907 Pathé released a 4-minute film based on this act. A pig tries to seduce a young girl but is humiliated when she rips off his tuxedo. Suddenly standing stark naked, the humanoid swine nevertheless starts dancing with her. It is rather boring but at the end (3:46) it gets really creepy with a close-up of the tuxedoed pig wagging its tongue between its pointed teeth. From one of our other sheet music, published the same year (1907), we discovered more about the origins of the Dancing Pig. ‘La Blockette’ by Albert Pharey, published by Costallat (Paris, 1907) and illustrated by Georges Dola. 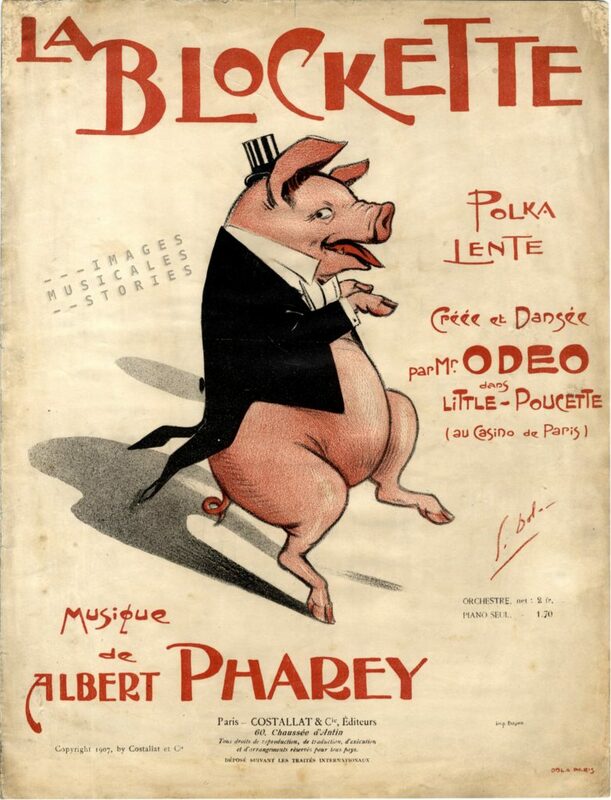 The man dancing in the Pathé film was Mr. Odeo, who had a dancing routine le Cochon Mondain. From 1906 until the early thirties, he toured the music-halls with this burlesque act. 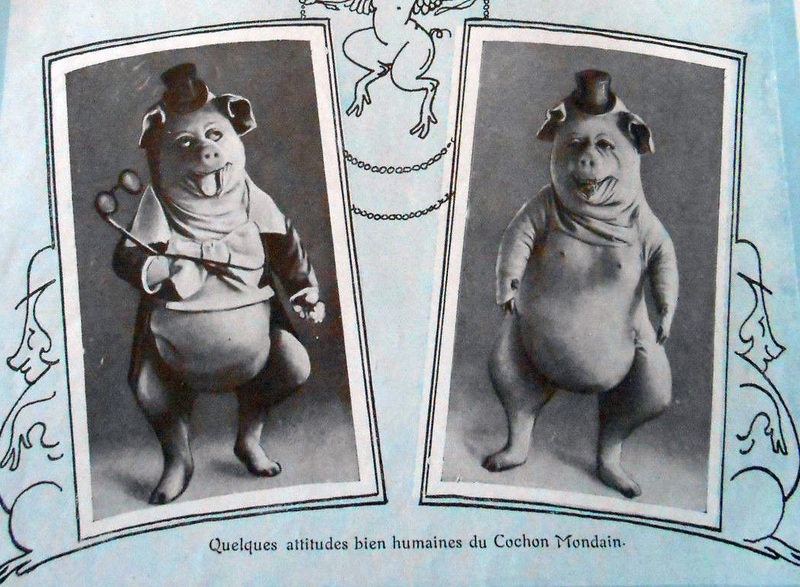 Mr. Odeo as le Cochon Mondain, 1907. 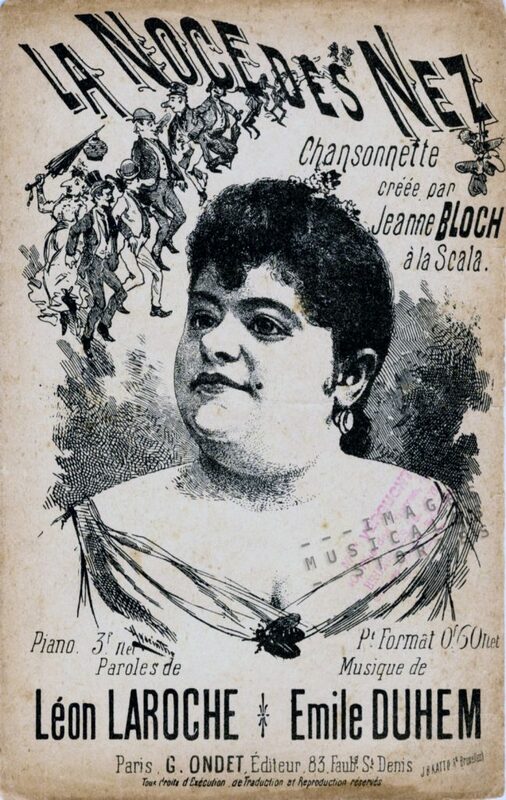 La Blockette, the title of the sheet music and the name of the piggish polka dance, was also the artistic name of actress and singer Fanny Bloch (1863-1956). 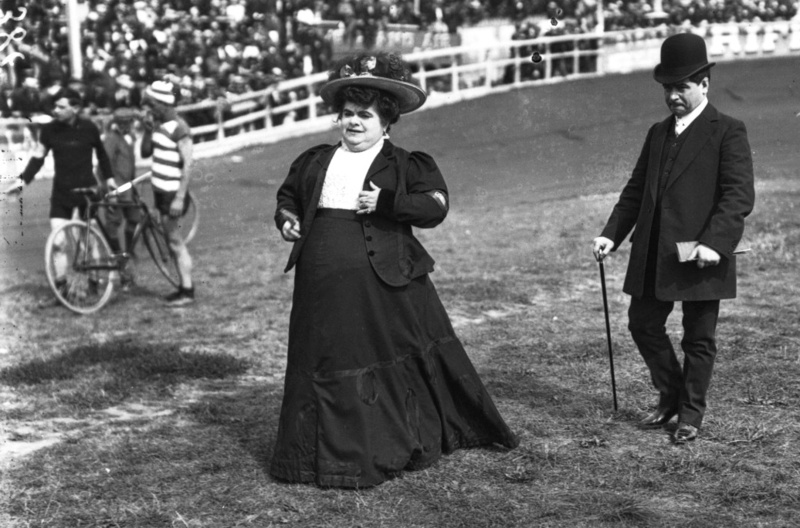 This is a bit confusing, as it is perhaps her older sister, comic singer Jeanne Bloch (1858-1916) who by her hefty looks inspired the name of the flabby polka. 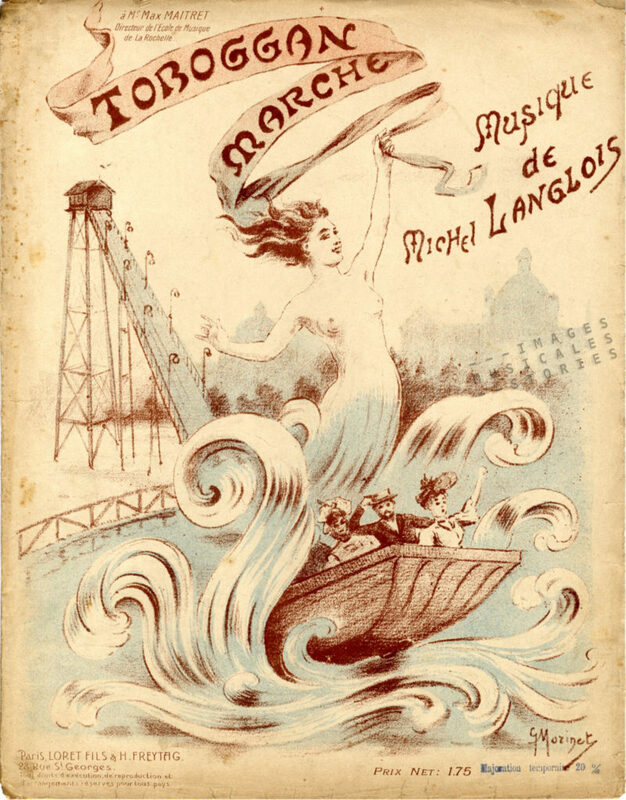 Portrait of Jeanne Bloch on the cover of ‘La Noce des Nez’ by Léon Laroche & Emile Duhem, published by Georges Ondet (Paris, sd) and illustrated by Hyacinthe Royet. 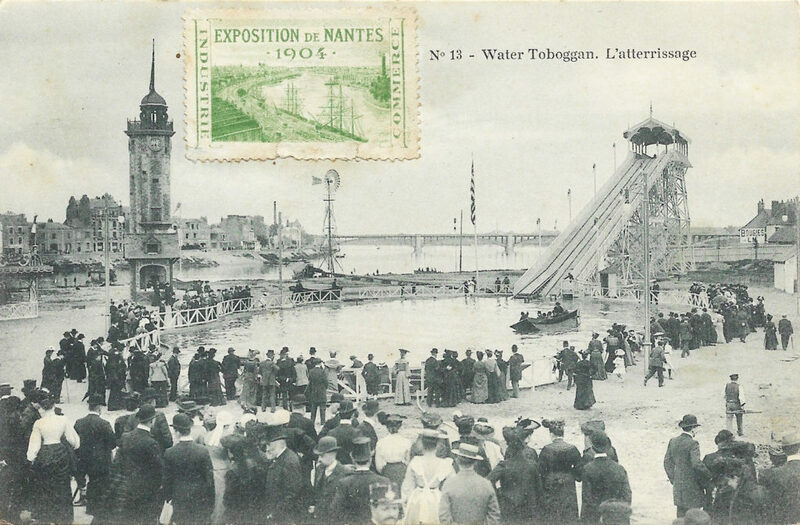 Jeanne Bloch was known as la colossale chanteuse and it was said, not very nicely, that she measured 1.60 m in all directions. 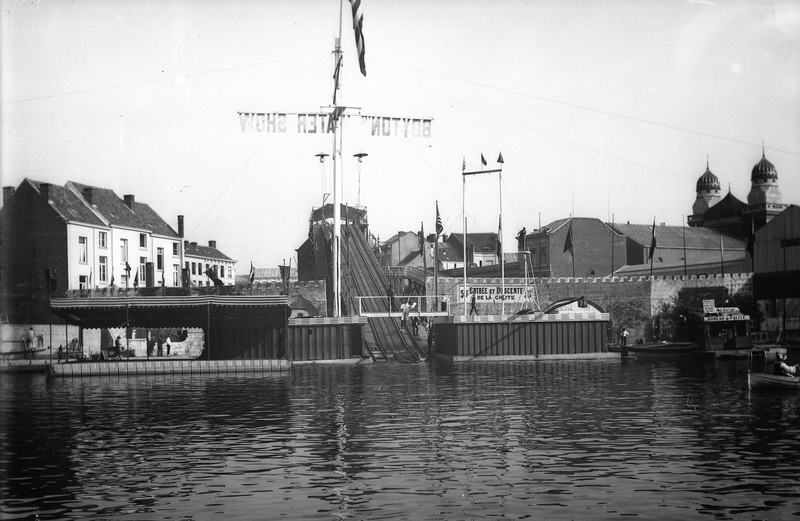 Jeanne Bloch – Fête des Caf’conc’ [stade Buffalo, le 24 août 1908], source BnF Gallica. 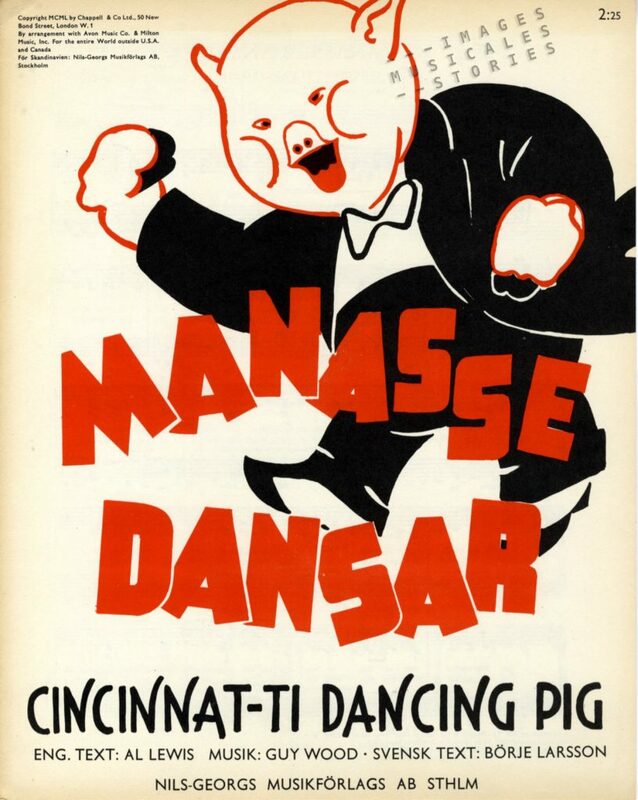 We have another cover of a dancing pig in our collection: Manasse dansar, the Swedish version of Cincinnati Dancing Pig, a hit for country singer Red Foley. Manasse dansar by Guy Wood & Al Lewis. Swedish lyrics by Börje Larsson, published by Nils-Georgs Musikförlag (Stockholm, 1950). 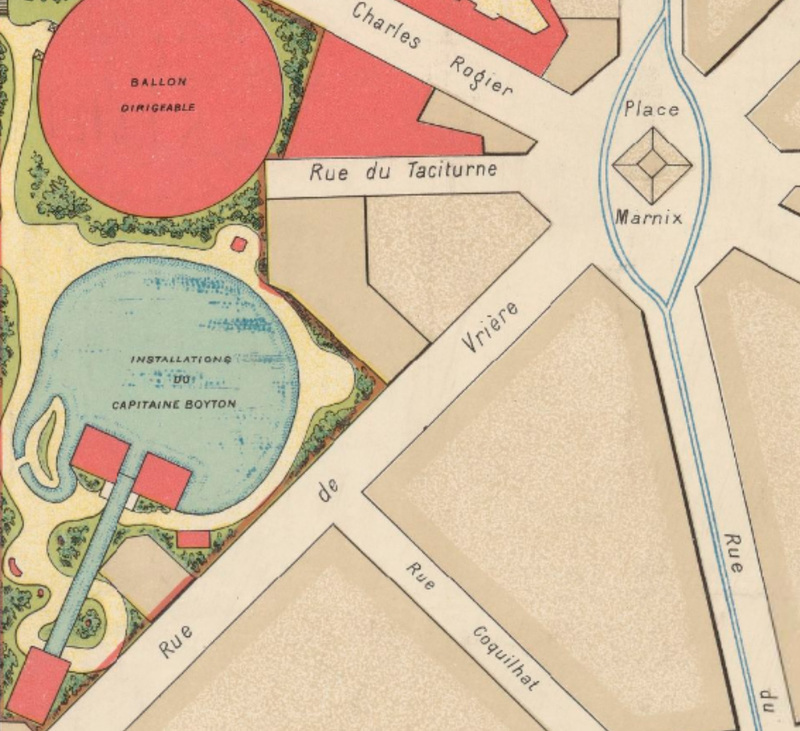 More reading on Jeanne Bloch at the wonderful site of Du temps des cerises aux feuilles mortes.